On rainy days such as today, I really can't figure myself going out shopping for ingredients, and I'd rather try to make do with what I have at home. I haven't been cooking fish for quite some time, so I decided to finally cook a sanma (Aguglia in Italian), which I vacuum packed and froze some time ago. I have been keeping a pack of sun dried tomatoes which I bought in Italy over a year ago, since I never found the inspiration to prepare them. Today, having limited ingredients for the seasoning, I decided to bring them back to life. To do that, I brought some water with a dash of vinegar to the boil and kept the tomatoes in the boiling water for about 10 minutes. I then let the tomatoes rest on an absorbent surface and squeezed any excess water out of them. I vacuum packed and froze most of the batch, and kept about 4 of them aside to cook this pasta for 2. 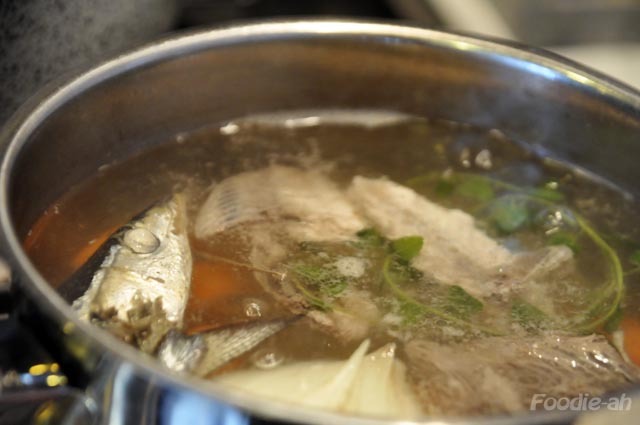 Remove head and tail from the sanma, remove the innards and discard them, debone it and put bones, head, tail, the carrot, onion and herbs into a skillet and bring it to a slow simmer. Keep this simmering for over 20 minutes to create the base for your pasta. 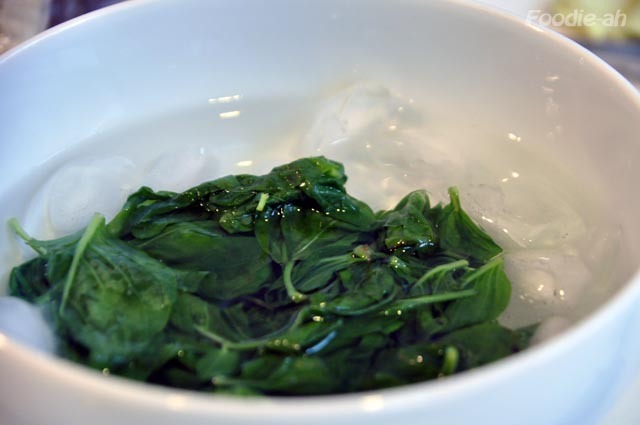 In the meantime, wash your basil leaves and blanch them for 10 seconds in a large pot of boiling water. 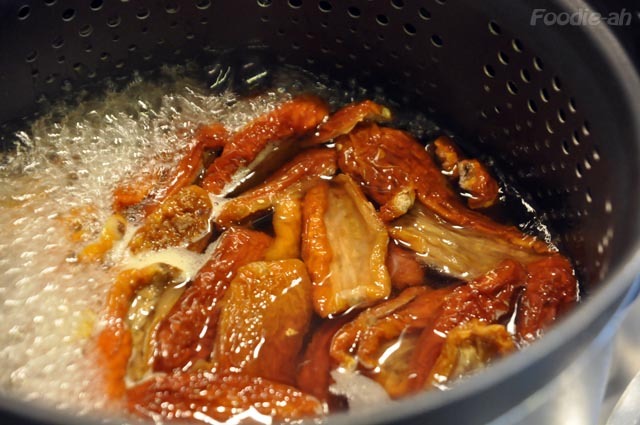 Remove them from the pot and immediately soak them into ice water. Gently squeeze all excess water, then put into a container together with the sun dried tomatoes, and half a garlic clove, finely chopped. Top with a drizzle of olive oil, then gently mash with an immersion blender until you obtain a paste that is not too fine. Add some freshly ground pepper to your paste, and there should be no need to add salt since generally sun dried tomatoes are already very salty. 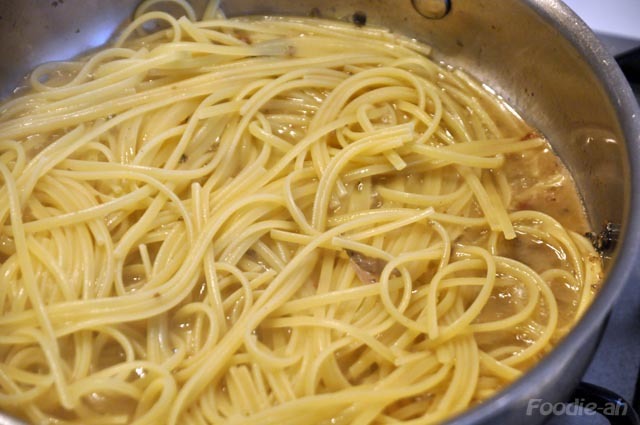 Bring a large pot of water to the boil, ready for your pasta, do not salt the water and add the linguini (which should usually take about 10-11 minutes to cook). 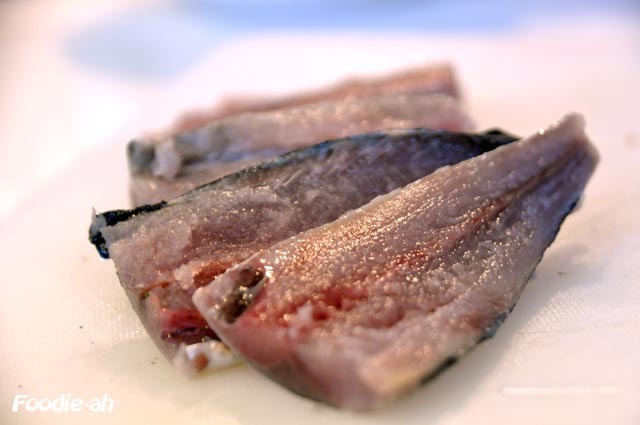 Wash your fish fillets, pat dry them and sprinkle them with salt. Lightly pan fry them on a large frying pan on both sides in abundant olive oil, then remove them and set them aside. Deglaze the pan with half a glass of white wine. 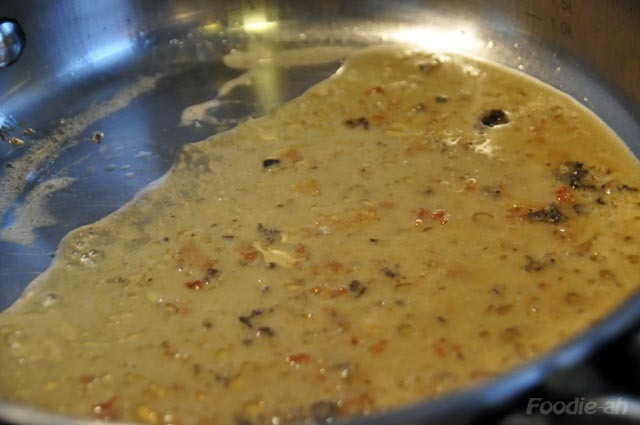 Once the wine evaporates, you should obtain a thick sauce as shown in the picture below. Now your pasta should be almost ready to be removed from the water. Make sure that you drain it 2 minutes before it's ready. 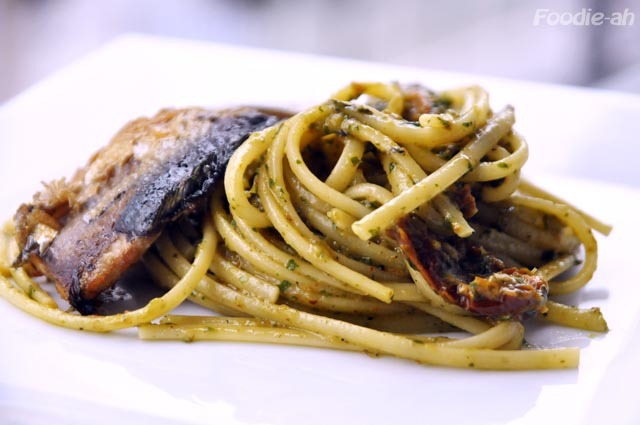 Add some of the simmering stock to your frying pan, put in the pasta and lightly salt (do not fully salt the pasta, to counter-balance the salty paste that you will combine later) and simmer until the stock is absorbed and your pasta is al dente. When the pasta is ready, remove it from the fire and rapidly stir-in some of the basil-tomato paste. 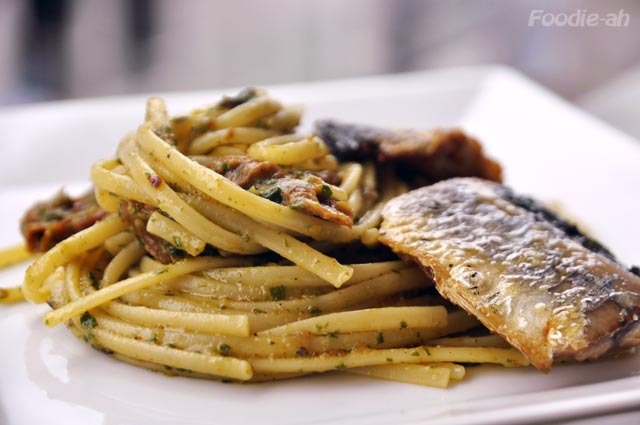 Arrange on serving plates, topped up with your sanma fillets (filetti di aguglia), and some freshly ground peppercorns. 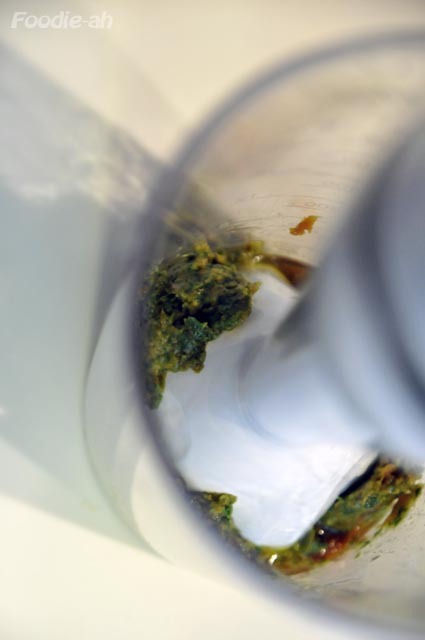 Enjoy the powerful aromas of basil and sun dried tomatoes!